"We had a good game and following with the first Vermintide - but you never know when you do a sequel"
Right out of the gate, Fatshark's Warhammer: Vermintide 2 was a success. The title launched in March, selling 500,000 copies in its first two days. In its first fortnight on shelves, the fantasy co-op game had generated more revenue on PC alone than the first title had in its entire lifetime.At last official count, the game has sold over one million units. Keeping in mind that the original Vermintide is on PlayStation 4 and Xbox One as well as PC, that's a pretty impressive feat. 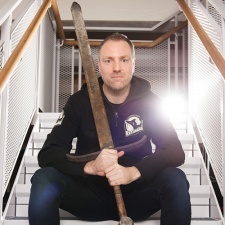 So, when we sit down with Fatshark's CEO Martin Wahlund (Ed - yep, the dude with huge weapon pictured), he is understandably in high spirits. "Obviously you never know what you're going to get when you do a launch of a game," he says. "We had high hopes. We had enjoyed playing it internally so we knew we had a good game but then, of course, there's stuff like marketing and PR and stuff everything going in the right direction. We don't have a huge marketing budget, obviously, but we got a lot of support from both media and streamers and from gamers all over the world which was fantastic for us. As a small, independent company, it's always tough to get through. We knew we had a good game with the first one and a good following. But you never know when you do a sequel. A key thing for me - my mantra during development was finding the right balance." Indeed, trying to do new things with a sequel is a fine line; developers have to retain enough of older releases as not alienate OG fans, while introducing new aspects to keep things fresh. "If you keep too much and don't do too much new stuff it can feel like a cheap sequel. If you do too much, you can anger people because you're moving too far away. It's a fine line," Wahlund admits. "We were more concerned about doing too much, to be honest. There's a lot of stuff you want to do but we had time to do it as well. This is just the start for us; like with the first game, we said before we launched it that no matter what happened we were going to continue to support it and if it's a slow start, we'll push out stuff to attract people. If it goes well, we'd do that anyway. That was the same with the sequel and it's gone really well. It's easy for us because we get the support from the players. It's much more fun to put out stuff when you have so many people enjoying the game. "If we take it step by step, we can see if a certain element we added has resonated with players. Adding too much at the same time means it can be quite hard to know what's actually valuable. We are working on doing free updates. We are going to have some paid DLC as well down the road. But we are trying to mix them up. We don't want to say 'free DLC' because that can be misleading. We want to have free content and paid content but staying true to our core values which are trying to have as little an impact on gameplay as possible. Like with the first game, if you buy the DLC, your friends can play, for example. We don't want to have weapons that alter the game in the DLC, too. We want to have a fair playing field. That's important for us." Looking back, Wahlund is mostly happy with the launch with the exception of one area. By the exec's own admission; localisation was done way too late in the day. "It's always chaos at the end when you release a game. You always say: 'We should do THIS' really late in the day," he says. "We did a lot of the localisation stuff a bit late, but we really got to push it out because we promised people the game would be localised. We realised that some of them were a bit sub-par but we worked day and night after that to fix them. Maybe it would have been nice to have had time to iterate on those localisations. That would be the biggest lesson learnt. I'd have liked more playtests with people from different languages. With the Chinese localisation, for example, we thought it looked super nice, super cool, but then there were some weird translations. One funny thing was there was a bit where you killed a boss and you get 30 extra health. But the Chinese localisation said: 'Kill your party leader' to achieve that. That was a bad one; it was misleading. We found it and we fixed it. Some more time to fix localisation would have been good. That would be my biggest thing if we were to redo it. We'd have done it earlier and sent it out to playtesters before. There's so much localisation in this game, so many subtitles. So it's not a quick fix." When we spoke to Ghost Ship Games - the developers of co-op shooter Deep Rock Galactic - that studio said that they felt like the co-op shooter market was under-served. Indeed, when Vermintide 2 launched, the title was in the Steam Top Ten with that title, as well as Crytek's Hunt: Showdown. So while it's clear there's demand for these kinds of games, but Wahlund says the market isn't underserved - at least anymore. But the exec says it was important for Fatshark to put its own spin on the genre. "When we decided to do Vermintide, we felt the co-op shooter market was under-served for sure," he says. "I'm not so sure it is today, however. There are a lot of good co-op shooters now. When we did Vermintide, it was really just Left 4 Dead and Payday. We felt this was a genre that had big potential, and playing co-op is fun. 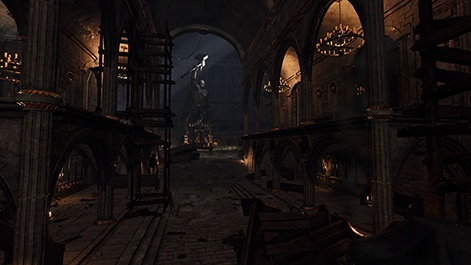 "We set ourselves to do the best melee combat and doing that first person is really tough. But the team really did a great job in managing to do that. It's a really tough task to do. There aren't many melee-focused co-op games out there. It's not an easy task to do and a lot of people in the industry have looked at what we have done and tried to mimic it but it's not that easy. There are a lot of small details to get it right, to get to the quality levels we have now." 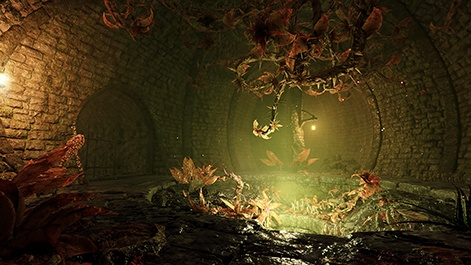 Looking forward, Fatshark wants to run Vermintide 2 as a service. Indeed, the studio was releasing DLC for the original 2015 title pretty much right up until the sequel launched. To do this, the studio has been divided into two teams; one will be handling concerns from the community, while the other will be looking at the bigger picture. "We want to be committed for the long-run, we want to put in a lot of resources to do stuff," he says. "Internally we have two core teams; one is supporting the audience, fixing things that need fixing. The other is looking longer term - adding new cosmetic stuff or new missions or whatever we want to do; new features and game modes. "Right now, most of the team is working on the community side of things, but over time once we have sorted out the most critical issues, we'll move people to the other team. We have people working on new content, of course, but the majority is working on fixing stuff for the community. Over time, we'll move more people over to content creation and having a smaller team fixing stuff that pops up. The exact balance depends on how much feedback we get from the community. There's probably 30 or 40 people working on the community stuff and 10 or 15 working on updates. The goal is to drop stuff quite often." The plan - as was the case with the original - was always to support Vermintide 2 in the long-term. But the title's early success has given Fatshark more confidence for its future plans. "It's such a luxury thing where you actually see your game do well early on because it gives you the confidence to continue work with it," he says. "That's the key thing, really. You see that people are working hard. Most games around the world have people working hard on them. But few get that kind of reception. A lot of times people are disappointed, either in terms of sales or in the critical reception you get. Most of the big sites have given us good reviews.They think it's a good game, which has helped us a lot. A lot of big streamers have helped us which is awesome as well. "People are just having a good time playing the game. As a game creator, that's the key thing for you. Sales are nice as they give us a platform to continue work on the game. That's why we do this; we love playing games, we love creating games. To continue to do that and see that what we do matters is so big for us. "It's a really humbling experience." Vermintide 2 dev Fatshark wants to be working on game for "five to ten years"